What is the Best Lightweight Hedge Trimmer of 2019? 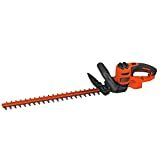 The Sun Joe HJ22HTE Electric Hedge Trimmer is the best lightweight hedge trimmer you can get for the value it provides. Taking care of your garden and keeping it in the best of shape is not an easy thing to do. Gardening tools have made your life a little easier but you still need to give your blood, sweat, and tears for maintaining your garden. One such tool is the hedge trimmer that helps you trim hedges, bushes, and shrubs in your garden. But you can’t seem to use one for a long period of time because of the weight. Trying to trim hedges overhead seems to strain your arms and shoulders till you need to take a break. That’s why it’s important you choose a lightweight hedge trimmer that will help you work without getting fatigued. So let’s take a look at the best lightweight hedge trimmer you can buy for trimming hedges in the garden. What is a lightweight hedge trimmer? What are the different types of hedge trimmers? Do you need a lightweight hedge trimmer? A hedge trimmer is a gardening tool that is used to trim hedges, bushes, and shrubs in the garden to make them look aesthetic. This hedge trimmer could be powered by gas, electricity, or battery. A lightweight hedge trimmer will help you trim the hedges without putting a lot of strain on your arms as you work for a long period of time. There are three main types of hedge trimmers you can get based on the power used by them. A gas-powered hedge trimmer makes use of gas to power it’s 2-stroke engine. They are quite powerful and can be used for commercial trimming of hedges. They are also portable as they work for a long time on a refill of gas. The gas-powered hedge trimmer tends to be a bit heavy because of the fuel tank and the 2-stroke engine it carries. It also creates a lot of noise and pollution as compared to an electric hedge trimmer. The maintenance of a gas-hedge trimmer is high because of parts like the gas tank, carburetor, spark plug, and air filter. The corded hedge trimmer runs on electricity when you connect it to a power outlet. This means that this hedge trimmer does not carry a power source such as a battery or a gas tank. So the weight of this type of hedge trimmer can be lightweight because of this advantage. This also lowers the cost of the hedge trimmer as compared to a gas-powered or battery-powered one. The main drawback of a corded hedge trimmer is you need to have a long enough outdoor extension cord that can power it. This also means the range of using the hedge trimmer is limited to this extension cord. The cordless hedge trimmer also runs on electricity but the power is from an attached battery. This makes the cordless hedge trimmer more portable than a corded hedge trimmer. But this also means that the cordless hedge trimmer’s weight increases as it has to carry the battery. The cordless hedge trimmer being electric creates less noise and pollution as compared to a gas-powered hedge trimmer. Though it is less portable than a gas-powered one that can run for a long time on a refill of the gas tank. A hedge trimmer will save you a lot of time and effort while trimming hedges, shrubs, and bushes in the garden. Maybe you cannot hold a heavy tool in your hands for a long period of time due to age or an illness. That’s where a lightweight hedge trimmer can help you enjoy working in the garden. The type of hedge trimmer you should choose is based on the purpose of using it. If you have lots of hedges and a large garden, a gas-hedge trimmer can be useful but it might be difficult to find one that is lightweight. A cordless battery-powered hedge trimmer is lightweight than a gas-hedge trimmer and offers more portability if that is what you’re looking for. The corded hedge trimmer tends to be the most lightweight and suitable for your needs but you are limited in portability by the length of the outdoor extension cord attached to it. There are some factors that you should consider before making your buying decision about a lightweight hedge trimmer. You’re looking for a lightweight hedge trimmer, so weight should be your first criteria in choosing one. A corded hedge trimmer should be your first choice based on its weight. That’s because many of these can be lightweight compared to a gas hedge trimmer or a battery-powered hedge trimmer. You do need to check the weight because some of the corded hedge trimmers can be surprisingly heavy as well. A hedge trimmer that weighs about 5-7 pounds should work great as a lightweight option for you. The type of lightweight hedge trimmer you should choose depends on where and why you are going to use it. If you have a small garden with a few hedges to trim, a lightweight corded hedge trimmer is more than sufficient. If you have a large garden with lots of hedges, you may need a bit more portability and opt for a gas-powered or battery-powered hedge trimmer if you can get a lightweight one. The power of the lightweight hedge trimmer is measured in cc, Volts, or Amps based on the type it belongs to. A gas-powered lightweight hedge trimmer comes with a 2-stroke engine whose power is measured in cc. You can get such a trimmer having a 21cc to 28cc engine. A cordless battery-powered lightweight hedge trimmer comes with a Lithium-Ion battery that can range from 18V to 56V. A corded lightweight hedge trimmer has power measured in Amperes. You could get one that has a 3.3 Amp to 4.5 Amp motor. The handle of the hedge trimmer should be comfortable when you’re going to use it for a long period of time. A wrap-around handle is good for comfort as you will be able to use it to trim in hard to reach places on the hedge. Hedge trimmers also come with handles that can be rotated to change the orientation and trim the hedge horizontally or vertically. Some handles also come with a protector that will keep your hand from touching the blade while in use and prevent debris from hitting your hand. The bar length of the hedge trimmer can vary from 16 inches to 24 inches. The one you choose depends on the size of the hedges in your garden. If you have tall hedges, you may need a longer bar length or maybe even a pole hedge trimmer. If you have small hedges, you need a hedge trimmer with a shorter length so it can reach in hard to reach spots. Blades that are high-quality are made from hardened steel that makes them very durable. They are also dual-action which gives them twice the performance while reducing the vibration when in use. The distance between the teeth of the lightweight hedge trimmer defines the cutting capacity. This measures the thickness of the branch that the hedge trimmer can trim. It can range from 3/8th to 3/4 of an inch. It might not be possible to trim all the area of the hedge using only a hedge trimmer and you might need a bypass pruner for trimming such spots. Choose a lightweight hedge trimmer that is flexible when it comes to trimming hedges. You want a hedge trimmer that can be oriented vertically or horizontally so you can trim the top as well as sides of the hedges without twisting your hands. It’s good to choose a hedge trimmer that comes with high durability and will last a long time. The durability of the hedge trimmer can often be linked to how high the quality it has. That is why we recommend choosing a lightweight hedge trimmer with good build quality even if you need to spend a bit more on it. Check that the blades are made of high-quality hardened steel and the build has a good plastic casing that is not flimsy. The same should apply to the screws and fixtures used to hold the lightweight hedge trimmer in place. The longer the warranty on the lightweight hedge trimmer, the more assured you are of getting service in case something goes wrong during the warranty period. So choose a lightweight hedge trimmer that comes with a good enough warranty. The price of the hedge trimmer varies greatly on the quality as well as the type you choose. Gas-powered hedge trimmers tend to be the most expensive compared to battery-powered and corded ones. The corded lightweight hedge trimmers tend to be quite inexpensive because they don’t need to carry a power source. It’s good to choose a lightweight hedge trimmer that comes with high-quality even if it costs a bit more. Because often the higher the price, the better the quality of the tool. If you’re on a budget and don’t want to spend a lot on such a hedge trimmer, you can choose a budget hedge trimmer that gives good enough quality while being lightweight and useful. A hedge trimmer is a sharp tool that can cause injury if you’re not careful with it. Use both your hands when working with the hedge trimmer to avoid the risk of injury. Ensure that the work area is clear from debris so you don’t trip. Make sure there are no children or pets running around in the work area. It’s advisable to wear protective equipment before using the hedge trimmer. This includes a good pair of gloves that can protect your hands from cuts and flying debris. Use safety goggles that will protect your eyes from the flying chips. If you’re using a gas hedge trimmer, it’s good to get earmuffs that protect your ears from the loud noise. Wear a long sleeve shirt and long pants when using the hedge trimmer for maximum protection. Keep a pair of bypass pruners in your pocket for branches where the hedge trimmer cannot reach so you can cut them with ease. If you have a gas hedge trimmer, make sure to fill the fuel tank before using it. For a battery-powered hedge trimmer, make sure the battery is fully charged. And if it is a corded hedge trimmer, you need to have a long enough extension cord. When using a gas-powered trimmer, check that there are no cracks in the fuel lines and the fuel tank. Check that the air filter is clean enough otherwise it needs a replacement. Do check the carburetor, spark plug, and the starter for any wear and tear as you may need to replace them. Rotate the handle to orient the hedge trimmer so it can cut vertically or horizontally based on trimming the sides or top of the hedge trimmer. Start the hedge trimmer and trim the hedge from the bottom to the top such that the top is a bit narrower than the bottom. This will help sunlight reach the bottom portion of the hedge and encourage overall leaf growth making your hedge look good. If you have evergreen hedges the best time to trim them is late summer. And fast-growing hedges the best time to trim is autumn. You can practice using the hedge trimmer to get a feel of the trimming experience as well as the vibrations you encounter. The more you use it, the more comfortable you will get with it. To trim the sides of the hedge, adjust the handle so the blade is parallel to the side. Start trimming from the bottom to the top keeping the top a bit narrow than the bottom. To trim the top of the hedge, adjust the handle so the blade is parallel to the top. Start trimming from the left to the right till you get a good shape. If you want to give a round shape to the hedge, you need to trim from bottom to the top but with an angular blade to create the shape. Keep repeating the process till you get a nice, smooth, round shape. Do check if there are some areas of the hedge that cannot be reached with the hedge trimmer. You may need to use bypass pruners to trim such hard to reach parts. Collect the twigs and branches you cut from the shrubs and hedges and fill them up in a bag. You can use this organic material as part of mulching your garden or in creating your own compost. The amount of maintenance your hedge trimmer needs depends on the type you choose. A corded or battery-powered hedge trimmer does not need as much maintenance as a gas-powered one. That’s because the gas-powered hedge trimmer has more moving parts involving the engine such as the fuel tank and lines, the carburetor, and spark plug. However, all hedge trimmers need maintenance of the blade so you keep it sharp and free from rust. Before and after using the hedge trimmer, make sure to clean the blades of any debris. You can use a clean cloth or brush to remove the debris and then coat the blade with some orange oil or vinegar for protection. Turn the hedge trimmer on for a few seconds so the oil coats all the teeth of the blade. Once you’re done with the trimming and maintenance work, place the hedge trimmer in a safe place away from children and pets. The Sun Joe HJ22HTE is a corded electric hedge trimmer that comes with a 3.5 Amp motor suitable for most regular hedge trimming work in the garden. The blade is 22-inch long and is made from stainless steel that is pre-hardened to make it quite durable. The front handle is full-wrap which makes it quite comfortable to use for trimming hedges at various angles. It also comes with a dual handed safety switch to protect them from injury. If you’re looking for a lightweight hedge trimmer, this is a contender because it weighs just 5 pounds making it a joy to use in the garden for a long period of time without fatigue. The Sun Joe HJ22HTE is quite inexpensive which also makes it a good budget hedge trimmer if you can’t spend a lot of cash on one. The only drawback of this lightweight hedge trimmer is that it has average power. This is sufficient for regular use in the garden but if you want a commercial hedge trimmer you can try some other options. The Sun Joe HJ22HTE electric hedge trimmer comes with a full two-year warranty on defects and problems occurred while using it. The Greenworks 22122 is a corded electric hedge trimmer with a powerful 4 Amp motor suitable for your garden hedge trimming needs. It comes with a 22-inch dual-action blade that is made from steel for high durability. The dual-action means it gives you twice the performance of a regular blade while reducing the vibration. 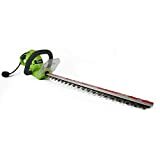 It can cut branches up to 5/8 inches thick with ease and control. The handle of this hedge trimmer is comfortable to use and can be oriented vertically or horizontally for trimming the sides and top of the hedge. The cord lock that comes with this hedge trimmer prevents it from accidentally unplugging from the power outlet while in use. The front guard will protect your hand from the debris that flies during the trimming process. This is a great lightweight hedge trimmer because it weighs just 5.72 pounds. You can use this in your garden for a long period of time without breaking a sweat due to fatigue. It’s also quite inexpensive if you’re looking for a lightweight hedge trimmer in a budget. The Greenworks 22122 electric hedge trimmer comes with a limited four-year warrant on defects and problems that arise when using it. 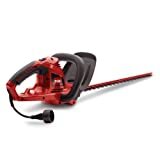 The Black+Decker BEHT350 is a corded hedge trimmer that comes with a powerful 4 Amp motor sufficient for trimming hedges, shrubs, and bushes in the garden. The 22-inch blade is made from hardened steel that improves durability. It also has dual-action which gives you good performance while reducing the vibrations during the trimming. The cord retention system of this hedge trimmer prevents it from disconnect while you’re using the trimmer. The handle is comfortable due to its full-wrap feature that helps you trim hedges with varying angles and gives you better control while trimming. This hedge trimmer is lightweight because it weighs just 6 pounds and is a joy to use in the garden for a long period of time. You do need to keep the trigger pressed so the trimmer is on while you are using it and stops the moment you release the trigger. Some find it useful while others don’t like to always keep their finger pressing the trigger. The Black+Decker BEHT350 comes with a limited two-year warranty on the tool if you face issues such as manufacturing defects. Lightweight compact cordless design for true portability - goes anywhere! Ultra-lightweight, ergonomic design - approximately 6 pounds! The WORX WG255.1 is a battery-powered hedge trimmer that works with a 20V battery. This should give you sufficient power for your hedge trimming needs. But if you’re looking for a trimmer that can be used commercially you may need to look elsewhere. The 20-inch blade is dual-action giving you good cutting performance while reducing the vibration on your hands as you do the trimming. It can cut branches up to 9/16 thick. The front handle of this hedge trimmer has a D-grip which makes it easy to hold and align with the top or sides of the hedge as you’re trimming. The WORX WG255.1 weighs just 6 pounds which makes it quite lightweight to use for a long time in the garden trimming several hedges, shrubs, and bushes. This cordless hedge trimmer comes with a limited three-year warranty against any type of manufacturing defects. The Toro 51490 corded hedge trimmer has a 4 Amp powerful motor suitable for trimming all types of hedges, shrubs, and bushes in the garden. The 22-inch bar is made of hardened steel that makes it quite durable. The blade is dual-action which gives better performance than a regular blade and reduces the vibration. It can cut through branches that are up to 9/16 inches thick. The handle is ergonomically designed and comfortable to use for trimming hedges at varying angles. This hedge trimmer comes with a cord lock system that helps prevent the cord from disconnect while you are using the hedge trimmer. You may find that the auto feeder does not work that well and you end up stopping and pushing the feed button often. The Toro 51490 weighs about 6.35 pounds which is not the most lightweight but it’s still good enough to use for long period of time in the garden without fatigue. This hedge trimmer comes with a full two-year warranty on the tool in case of any problems. It’s time to relax a bit. With the best lightweight hedge trimmer, you should be able to trim hedges, bushes, and shrubs in your garden without breaking a sweat. 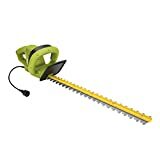 The best lightweight hedge trimmer you can choose is the Sun Joe HJ22HTE Electric Hedge Trimmer which is very lightweight, does a good job trimming, and won’t burn a hole in your pocket as well.